Keep all your data in your Android safely at all times is to transfer them to a computer. This is vital for you if you make your Android phone the repository for important files. Losing your phone could be disastrous because all your files will be gone. The same fate awaits you if your phone is broken or submerged in water or when you accidentally delete your files. A virus can attack your phone and obliterate everything or disallow you to open the files. Or your system may crash, resulting to massive data loss. You might also think of replacing your old phone and are wondering how to transfer all the file in a quick way. 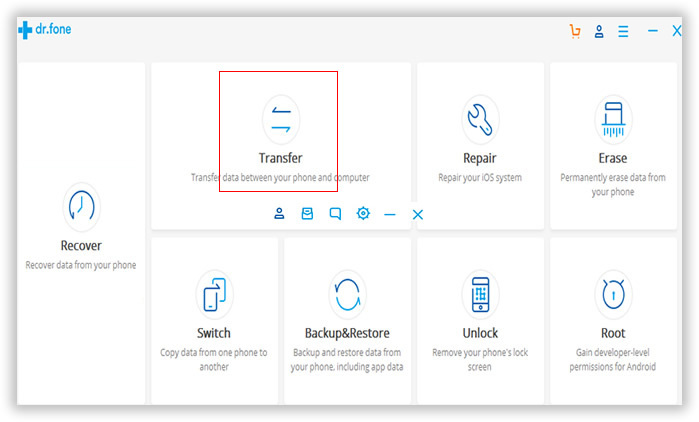 Besides, once you have backed up the files, you can permanently delete them in our cell phone to free some space and to optimize the functioning of your phone. How can you protect yourself from this catastrophe? Here is a solution to this issue. Android Manager is your first choice which designed to transfer files from your computer to Android phone or transfer files from Android to computer. 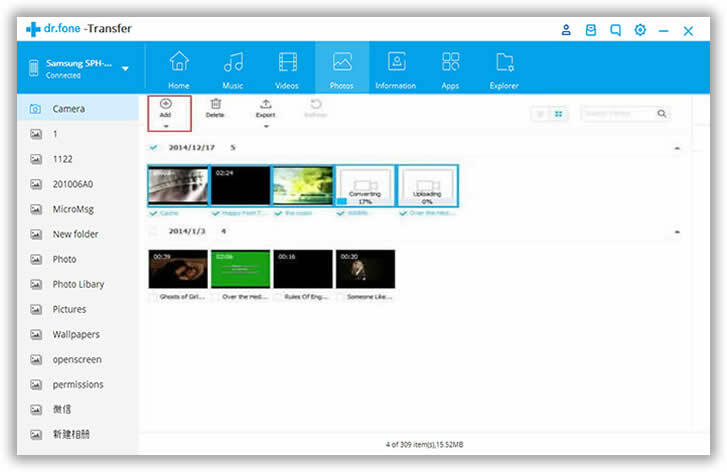 This can make creating backup for all contents of your phone fast and easy. Once you have downloaded the file to your personal computer, you are just a few clicks away total assurance that your files will always be safe. You can copy and save all files or you can transfer selected files, then save the files for future use. With a backup in your computer, you will have peace of mind because no matter what happens to your Android, you can get back all important items that you have stored on it. For a better understanding, it is recommended to read: how to export Android SMS to PC. When you got a new phone, one of the most frustrating things is how to transfer large number of files from your computer to new phone, like photos, music, apps, messages, contacts and other data, because it's a tricky and time consuming thing. As a android user you should be smart enough to get your work done very quickly, there are a few solutions that I've previously mentioned, but none are as versatile as using Android file transfer, which let's you simply control and manage your Android device in your computer or laptop, each time you connect phone to computer into USB, it can automatically detect your phone and access to your Android phone content, then move everything from your computer to new phone. Supported Android Phones: Samsung Galaxy S, HTC, Motorola Droid, LG, Sony Xperia, ZTE.etc. Install and run the trial version of the Android file transfer program, you're required to plug your Android phone to PC via USB cable. Then program will detect your device and show the basic information of your device. 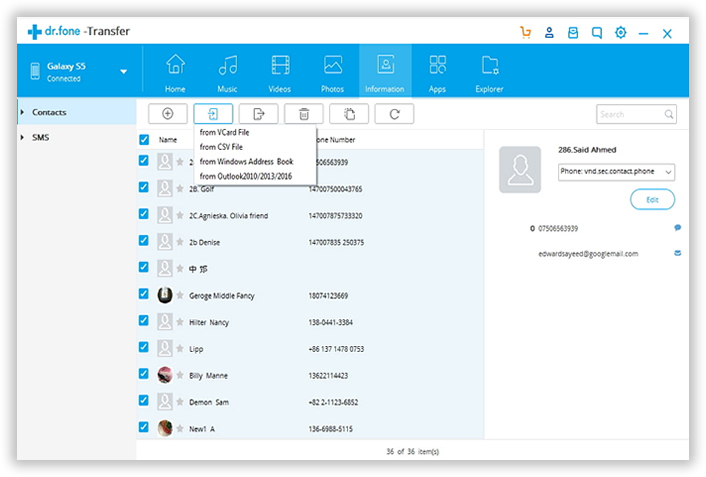 When it detects our device successfully, then all the files that stored on your device will be divided into some catalogues and displayed with details in the left bar of the interface, including Contacts, SMS, Music, Photos, Videos, Apps and other files. For example, it you want to see the detailed information of Music, just click the 'Music' tab on the left bar, it will show all the music on the right area with details. You can simply move them to your computer by click the one you want. Then click the 'Export' to begin to move. You can also directly transfer music from PC to your Android phone by clicking the 'Import' button. A pop-up window will show you how far the process goes. To transfer videos from PC to your Android devices, just simply click the 'Videos' > 'Add', it shows all the videos files on the right, then mark the video files you want to and click 'Add' to move it to your Android device. 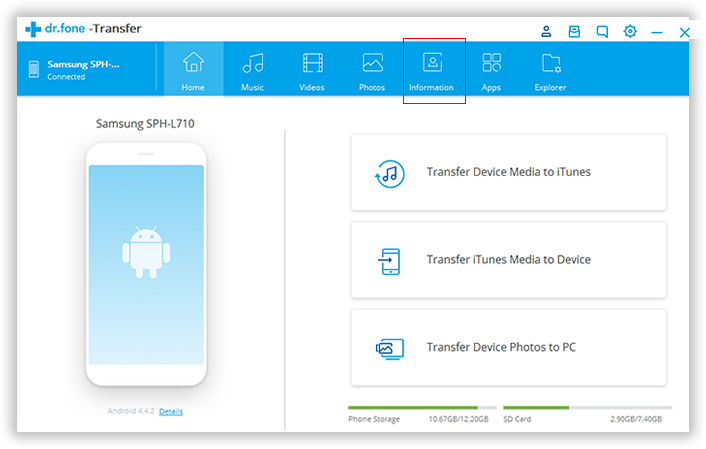 If the transferred videos isn't compatible with your Android device, don't worry, this program is capable of converting it to supported format. 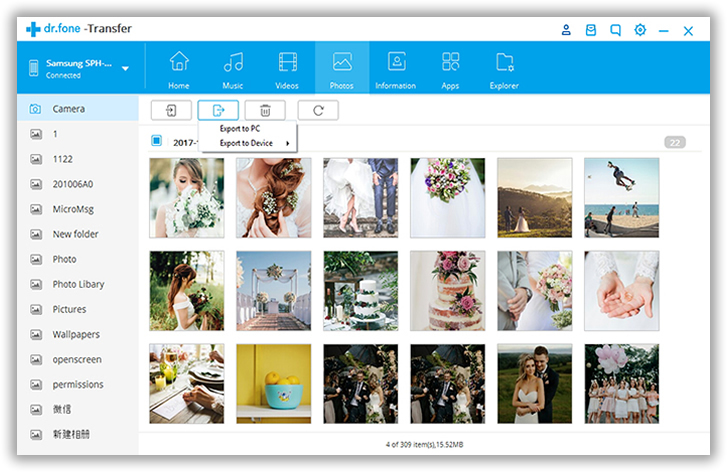 For photos, it is also a simple matter when you need to transfer large number of photos from PC to your Android phone and vice versa. Click 'Photos' button. Then you can see all folders on your Android phone are display as a list, you only need to select a folder to save the transferred photos, or create a new folder. Then click 'Add' to start importing photos from PC, or you can directly drag and drop photos by your mouse. If you need to move messages from the previous SMS backups to your Android devices, just then click "Import" > "Import SMS from computer", its premise is that you've create a SMS backup file on your computer. Then mark the SMS backups and start to import to your device. 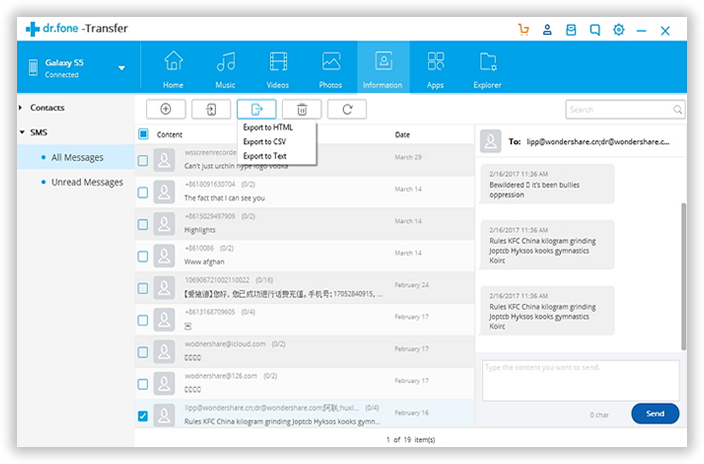 This program scanned all the messages that already exist on your phone; you can easily export SMS to PC for further use. Note: One of the most central features you never neglect is that it allows users to directly send messages from PC to the others and receive messages via PC. You can easily import contacts from Outlook, Windows Live Mail, and Windows Address Book to your Android phone. Press the 'Import' > 'Import Contacts from Computer', and star to import contacts from vCard files. There are many kinds of features I will not introduce one by one, the best way to really get a feel for the enhancements described here is to download the trial version and play with it yourself, this is the best advice I can give you. People who are aware of the risks of relying on Android phones in keeping their important data create backups for all their files either in their personal computer or in another device. This protects them from the impact of total data loss. But many people do not make this precaution because they think no harm would come to their files or they do not know yet how to transfer files from Android phone to their personal computer.